MORE THAN 300 YEARS AGO, a young Dutch sailor named ABEL TASMAN stood on the prow of a ship that he and his crew had sailed across wild, uncharted waters. In the distance, the rugged outline of steep hills rose from the ocean waves. 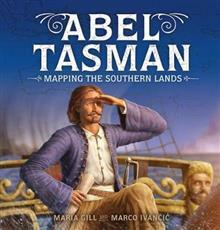 COULD THIS BE TERRA AUSTRALIS - THE GREAT SOUTH... read full description below.